UPDATED: Wed., Feb. 6, 2019, 10:34 p.m. Sometimes the best way to stand up to bullies is to sit down and laugh. Wednesday morning at Shaw Middle School, four actors from the Seattle Children’s Theatre brought some serious humor to a tough subject. “Above, Between, Below” is a half-hour presentation that explores the serious harm of bullying. The play has been seen by 20,000 students statewide this year. But does it really reach them? 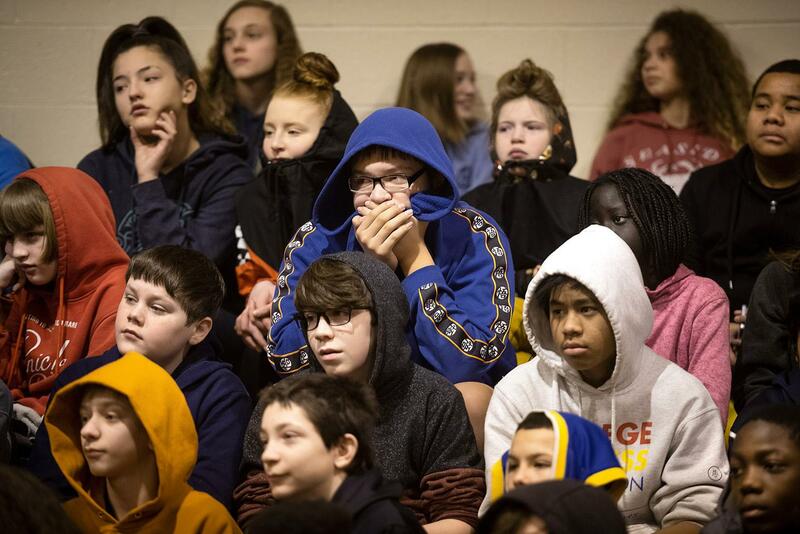 It seemed to on Wednesday, as rapt students watched a dramatized version of everyday life in the halls at Shaw and every other school in America. Middle schoolers are perhaps most affected, according to Shaw assistant principal Yuliya Hall. “These kids are switching from elementary school to middle school, and their access to social media is overwhelming,” said Hall, who arranged the show’s stop at Shaw. The message was delivered during two performances in the Shaw gymnasium, with eighth-graders getting the afternoon showing. The plot was simple and deep at the same time. The performers – two men and two women – acted out the emotional roller coaster of bullying in its most common forms. Later, a male student is physically bullied by another, who also implies that the other boy may be gay. The portrayal was so real that counselors were standing by in case the message struck too close to home. “Sometimes just the acting out of bullying can trigger some of the students,” Hall said. Minutes later, the tables are turned on both bullies before all four characters decide to talk honestly. That kind of happy ending is rare in real life. According to National Center for Education statistics, 90 percent of the nation’s fourth- through eighth-graders have reported being harassed or bullied in some way. A report sponsored by the National Education Association states that more than 160,000 children refuse to go to school each day because they fear bullying. The same report states more than 280,000 high school students are physically assaulted. “This play shows how vulnerable we all are,” said Wellesley Chapman, a physician with Kaiser Permanente, which sponsors the show. After the show, the actors offered some perspectives on bullying, including the fact that actions can have unintended consequences; that bullying is a behavior, not an identity; and that depending on the situation, individuals can be on the giving and receiving end of bullying. They also answered questions from the audience and tried to convert bystanders into “upstanders,” or people who will stand up to bullying in all its forms. “We hope this will open up some eyes,” Hall said. Published: Feb. 6, 2019, 8:01 p.m. Updated: Feb. 6, 2019, 10:34 p.m.